The Barrington Area Chamber of Commerce (BACC) and Women’s Biz Net (WBN) will honor local women leaders during their inaugural Outstanding Women Leaders (OWL) Awards Luncheon on September 27, 2018 at the Biltmore Country Club, 160 Biltmore Dr. in North Barrington. OWL Award Recipients will be recognized in the following categories: Professional Excellence, Community Contributions, Nonprofit Leadership, Mentorship and Education. OWL Award applications are now being accepted and must be submitted to the Barrington Area Chamber of Commerce by August 20, 2018. 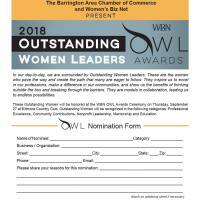 Nominations for the OWL Award are now being accepted and forms are available at the Chamber office located at 190 E. James St. in Barrington, or can be downloaded from the BACC website at: www.BarringtonChamber.com.